For five years in a row we’ve worked with Crowdstrike to bring the crowd at the RSA Cyber Security Conference some really cool items. For 2019 we brought out the big guns: our original, on-demand custom sublimation app. 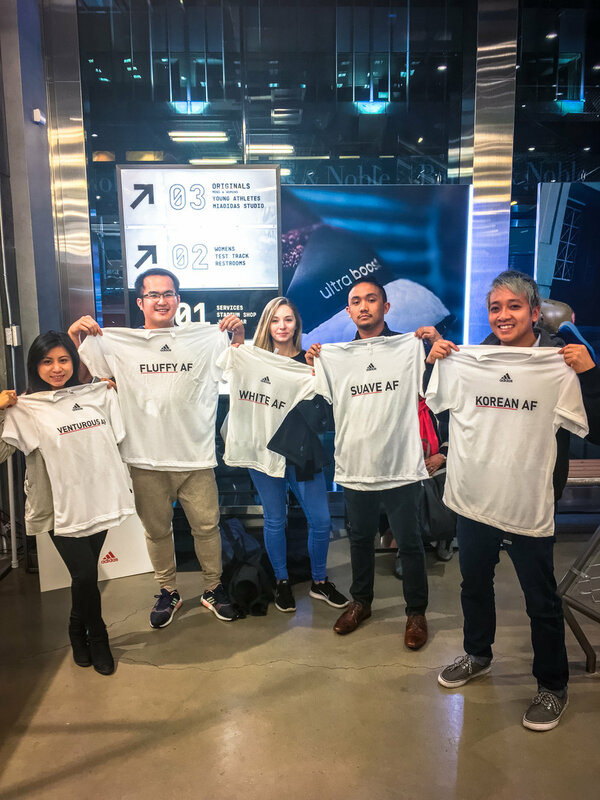 Guests were floored when they stepped up to one of our tablets and saw their custom, Crowdstike branded t-shirt come to life right before their eyes. Universal tasked Family Industries with an activation to stand out amongst the crowd at the 2018 Licensing Expo in Vegas. We designed and created a custom app to allow guests to use various movie properties to customize tote bags and notebooks. The experience allowed attendees a chance to catch a break from on-site meetings and learn about licensing opportunities with Universal. Family took our print on demand set-up to the Vision Expo East to customize shirts for our friends from Nike Eyewear. Vision Expo attendees were able to choose from a variety custom designs on the front of the shirts, and choose a name and number for the back of their shirts. The activation was an absolute hit, as the shirts ran out in a matter of hours. Asics needed a big idea for a last minute activation at the 2018 Bonnaroo music festival. Fortunately, Family was able to build a completely custom app to allow guests to create 100% custom full color bandanas on-site. Festival attendees were happy to be able to rep their custom made design throughout the campgrounds and all over the festival. Over 2500 bandanas were printed and handed out to festival attendees. 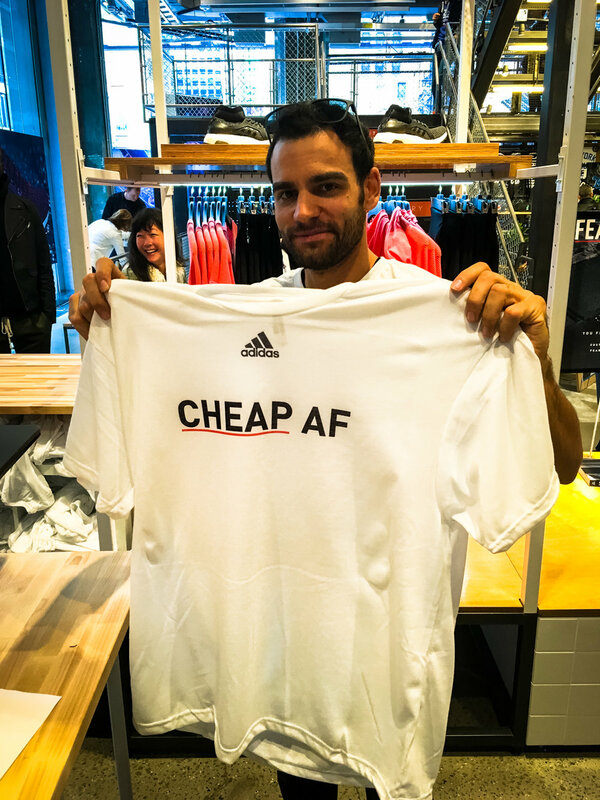 We packed our gear and set our coordinates for the Adidas flagship store in NYC. On-site guests and attendees were able to customize their very own ______ A.F. t-shirt. Whether the guests felt "Suave AF" or "Fearless AF," they were able to tell the world by being able to customize their very own shirt. Our team design and implemented the custom app and backend moderation for a highly successful activation. During the 2016 San Diego Comic Con, Cartoon Network had Family out to custom print 4000 shirts and bags for their Powerpuff Girl booth activation. Due to the popularity of the custom printing, they asked us to join them again in NYC for a 4 day pop-up shop in the Bowery District. The pop-up was open all day and well into the night with guests lined up to grab up some of the many great Powerpuff Girl items available. Our team was on-site with 15 tablets loaded with the famous "Power Puff Yourself App" that made waves in the online community throughout 2016! On-site guests were able to design their own custom Powerpuff Girl avatar and have them immediately printed on shirts, totes and mugs! Adidas asked Family to print on-site for the hyped LVL3 in Las Vegas as part of their experimental Maker Lab activation. 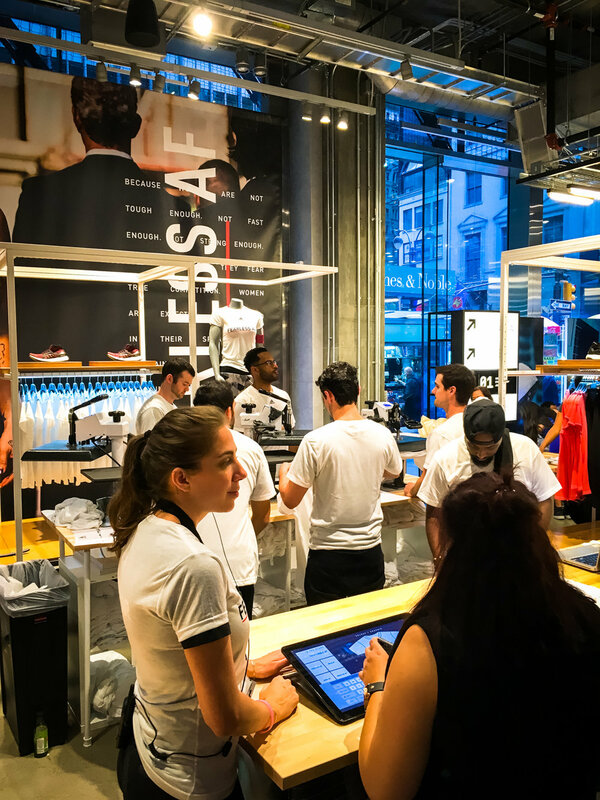 Our team worked alongside the brightest minds to create and customize an app where guests were able to drag/drop/resize their multicolored Adidas designs and add custom names and numbers to the backs on the fly. 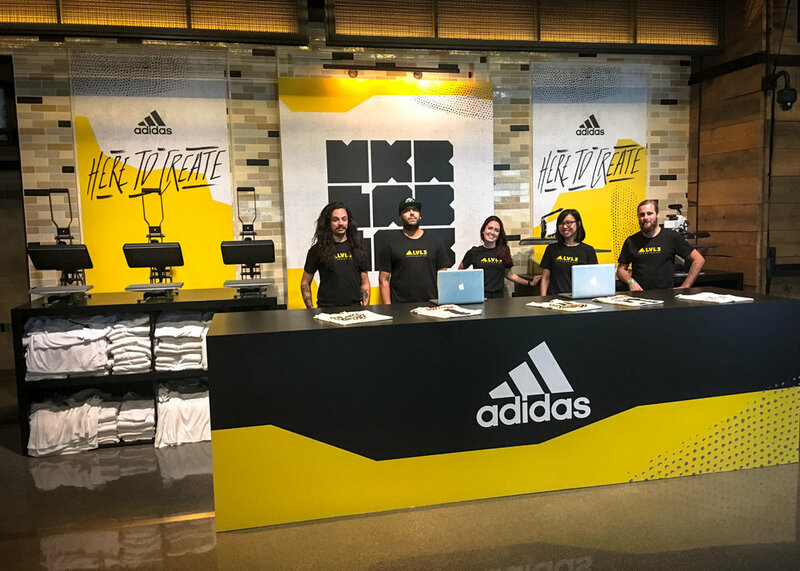 With our large format 20" tablets mirrored 50" TV screens, guests were able to show an 3000 eager attendees just how custom they wanted to go with the Adidas LVL3 shirts. Everyone’s favorite place to shop (and streaming service,) Amazon, had us out to the 2017 Comic Con to promote their new brand new streaming series, The Tick. The set-up on-site was a massive escape room experience where guests who were brave enough went through a series of cleverly designed rooms in which they were asked to find clues and solve a mystery. The culmination of finding all of the clues ended in our custom The Tick print shop! Our on-demand print app was the highlight of the activation in the final room. Guests had their choice of a Custom T-shirt, Tote bag or Drink Koozie. Family Industries took over VidCon 2017 with everyone's favorite hunger killing candy bar, Snickers! On-site guests were able to let everyone know how they were feeling by expressing their moods with their custom "Hungry, Why Wait?" branded shirts. Moods that were available in the custom app included options like "crabby, princess, and oddball." 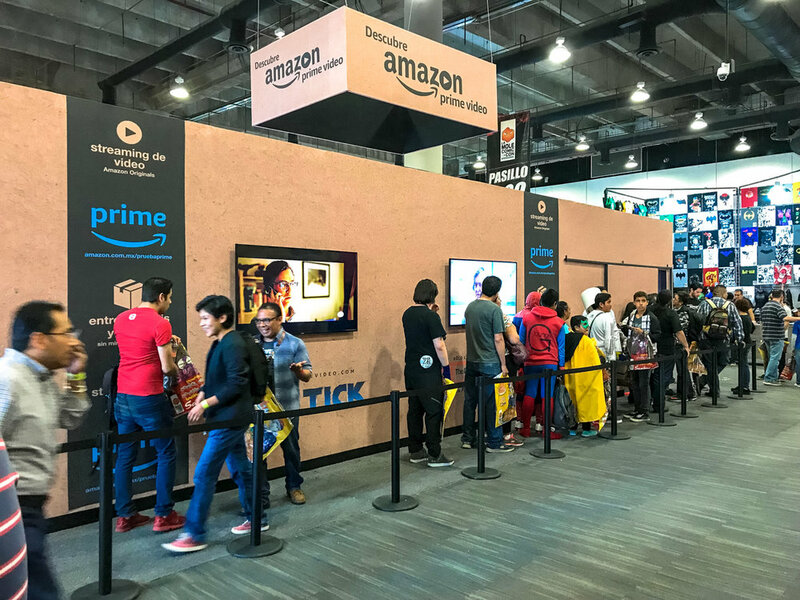 Following the success of the San Diego Comic Con, Amazon needed to one-up their on-site experience for guests attending La Mole (Mexico City's annual Comic Con.) Our team was tasked with creating a custom app that allowed guests to spin the "Wheel of Destiny" in order to choose their custom printed tote bag. The app highlighted five main characters from the show. On-site our print team customized over 2000 items over the course of three busy days! It's always a blast to travel outside the US and meet new people across the globe. Mexico City was an incredible host! 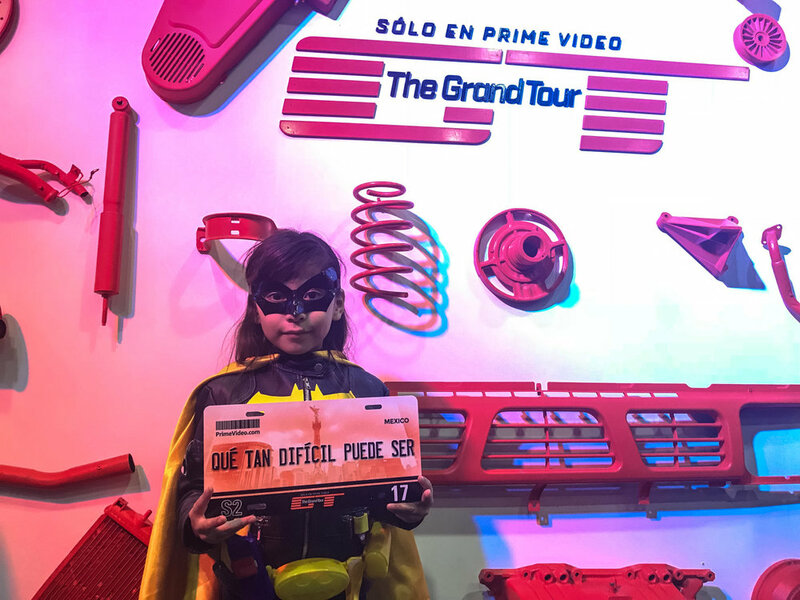 Stationed inside of a gigantic Amazon Prime Package in the center of the La Mole convention floor, the Family Print Team customized thousands license plates inspired by the Amazon Prime show "The Ground Tour." With our custom app in tow, guests were able to choose between over 30+ designs and sayings on the spot. Lines were long and good times were had by everyone! Family Industries has toured with Toyota & Supercross over the past 4 years customizing everything from license plates to car flags using our custom drag and drop design app. Guests hop into a brand new Toyota Tundra and customize their premiums design on tablets that are mounted on the interior of the truck.